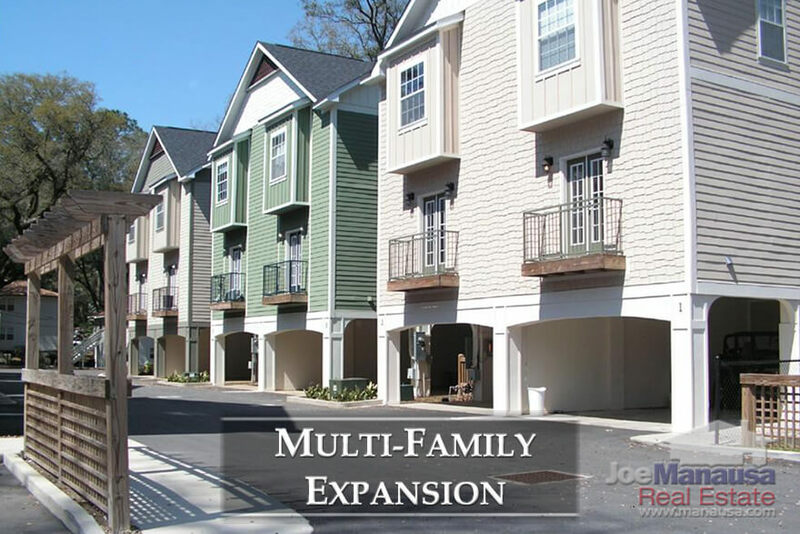 In this week's one-page special report on the Tallahassee real estate market, I wrote that I have concerns about the growth of multi-family for rent that are absorbing many would-be buyers who are not finding homes in their price range. One long-time reader asked me to elaborate, so I have prepared this fairly comprehensive report to answer his question about the changing landscape in Tallahassee housing. The best way to tackle this in its entirety is to take a step back and to view the Tallahassee housing market in its entirety. One mistake that the real estate industry often makes is that it separates the "for sale" market from the "for rent" market when supply and demand analysis are performed. This is a big mistake. What we really need to do is recognize the concepts of use and absorption. For example, if a landlord cannot find a tenant for a single family property, it is very likely he will sell the property. Conversely, when a homeowner cannot find a buyer for a home, it is often then converted to the rental market. Thus, we have to look at consumption and the production of all residential units if we want to accurately forecast in any segment of the housing market. It is only when a property is used/absorbed (occupied through lease or purchase) that a change in the market has occurred. An empty residential unit, whether for rent or for sale, needs to be consumed or used. The fact that it moves from one part of the market or another really has no impact on the global view of our housing market. For example, if somebody decides to build a bunch of for-rent units, it has an impact on the entire housing market, from top to bottom, as the new units will compete for consumers. In this way, you can imagine a trickle (up and down) effect between our most expensive homes and our cheapest rentals. Whenever we add inventory to one part of the market, it will immediately impact similar properties and similar consumers, creating a bulge or void in the overall market that all prices ranges will eventually shift to accomodate. Whenever I need information about residential permits, new developments, or data concerning the growth of Tallahassee, I reach out to Ed Young, the Deputy Director of the Tallahassee-Leon County Office of Economic Viability (OEV). He has a wealth of information about everything in the works around town. The OEV has other great resources as well. For example, if you would like to see an interactive map of ongoing projects, check out this page here. It will take you to a live display that looks like the image below. In a nutshell, this site will show you that there are nealy 3,600 multi-family units under construction right now. Additionally, there are thousands that have come online and are open for business today, and yet the market is still seeing a run on prices and inventories (for sale) are too low (see current inventory report here). When we look at all residential building permits for nearly 50 years, the reduction in recent permitting is very obvious and concerning. The graph above stacks all residential building permits (detached single family in blue, attached single family in pink, and multi-family in red) and then plots the average annual total of these in green. For forty years, the total number of residential permits issued each decade were very consistent, but the crash of the market in '06 has changed things. The green line in the graph shows that were are producing housing units (of all types) at a rate that is less than 1/2 the historical norm. And that has me concerned about the suppy side of the market. Tallahassee was over-built from 2002 through 2005, and thus a reduction in permits was a natural step in the recovery. The overall supply and demand of homes for sale in Tallahassee hit perfect balance in May 2016 and has since moved to an inventory shortage (sellers' market). Currently, the relative supply of homes is the lowest I've seen in my 27 year career. The cost of building homes continues to move higher. Demand is not at an all-time high but is stronger than all but the three years of 2004 though 2006. Tallahassee has taken longer to recover (both the housing market and economically) than has the State of Florida. 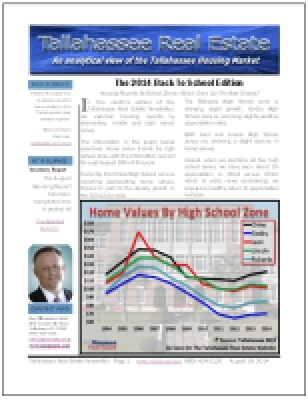 The populaton growth rate in Tallahassee has slowed since 2010. 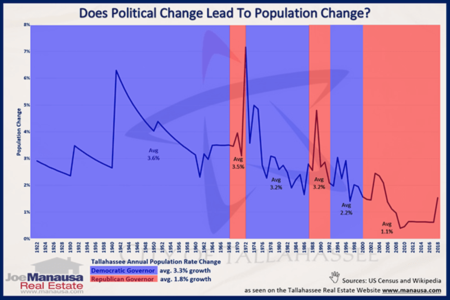 While this is not something that can be confirmed for several years, it is generally accepted that our population growth rate is about one half of its historical norm (slower growth does mean we need fewer housing permits). Both Banks and Builders (once bitten, twice shy) have good memories and are very concerned about speculative building. 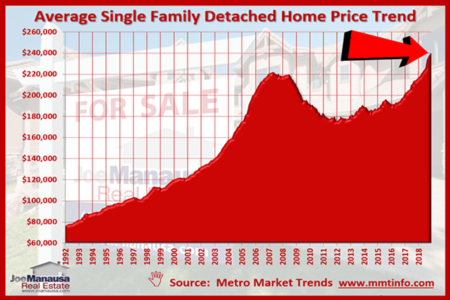 The decline in single family detached and attached homes is heavily influenced by these collective memories. Many of Tallahassee residents who purchased or refinanced homes during the peak of the housing market have been essentially "trapped" in their homes, not able to pull enough equity from their existing home to get them into the next one. But each year as values rise, more of these homeowners are gaining enough equity to make a move, and many are looking for homes that do not exist. Tallahassee is very likely to expeience a surge in demand for homes with the election of a new Florida Governor. What is the likelihood that the next Governor will be as fiscally sound as our current one? Bigger government will likely mean more jobs in Tallahassee. Jobs = Demand For Housing. Charlie, I believe the reason that we are seeing a plethora of new apartments (both non-student and student targetted complexes) is due to several factors. First and foremost, people are demanding places to live and our local home builders are not building enough homes right now to satisfy demand. Whether consumers want to rent or own, single family or multi-family, the choices are too few. When we combine the relative supply of homes (all-time low) with fewer building permits, we should understand that we are only exacerbating the inventory shortage. People have to live somewhere, so the multi-family builders are doing very well right now. Builders and banks need to recognize the difference between theory and realtity. In theory, population growth has slowed. In reality, buyers are standing in line awaiting new homes. If our local builders do not provide new homes, then we will see out-of-town "big money" builders step in (often times through multi-family products) and fill the void in the market. I believe Charlie is right in being concerned about the rental market. We are going to see (especially in the student areas) a migration of students from "old and worn" to "shiny and new." The single family homes, condos, and townhouses that have been housing students for the past fifty years are going to go empty (it's not like the schools are growing, right?). Those empty units will need to get cleaned up, but they soon will fetch a premium in the "for sale" market and eventually the non-student "for rent" market. These homes are perfect to satisfy part of the void not being filled by home builders. Areas that were once family neighborhoods that had been over-taken by the growth of the schools will now be reverting back to families as students flock to the new apartment complexes with the big pools and the shiny new amenities. I believe the next wave of "new to the market" homes will come from numerous investors that no longer want to deal with rising vacancies as neighborhoods go through their transitions. Finally, I'm concerned that our local builders and banks, due to a lack of action, are creating opportunities for investment firms and contractors from outside of Tallahassee to fill the demand for housing units. We should aim to keep these projects local in nature. People need a place to live, the supply of homes for sale is at an all-time low, and right now it's the multi-family producers that appear to be attempting to solve our housing problems. The joker in the deck of this poker game is the timing of the upcoming student loan debacle. Right now, the Government is in the business of covering financial need. The more school and housing prices go up, the bigger checks that the Government writes. In the current situation, there is no incentive for the Students to be frugal and not much of a disincentive to raise tuition costs and rents. The Students seeking out the "shiny and new" aren't very price sensitive because they know big daddy government will pick up the slack. Meanwhile, loan payment are getting larger and starting salaries for professionals are getting smaller since everyone is getting a college degree these days. But at some point, the money will stop flowing like it is. Student loans and grants will get smaller and harder to get due to caution stemming from loan defaults. When that happens, the pendulum will swing the other way, and students will have to be economical like they were when I was in school (yeah, I'm old). No more living on credit to pay for apartments with smoothie bars, hot tubs and shiny workout rooms...the students will become price sensitive and look for cheaper places to live, like they did 15 to 20 years ago. Then it will become like it was, as the kids share modest rental units to save money. As a parent with two in college and one more to go ... I hope you're suggesting ten years from now :). For that to happen, we'll need politicians with a 'do things right' approach, as opposed to the current vogue of 'give people what they want.' I'm not so sure Americans will vote for real leadership Steve. I see only a complete failure of the system as the eventual turning point, and don't you think this (can) can be kicked down the road for many more years to come?